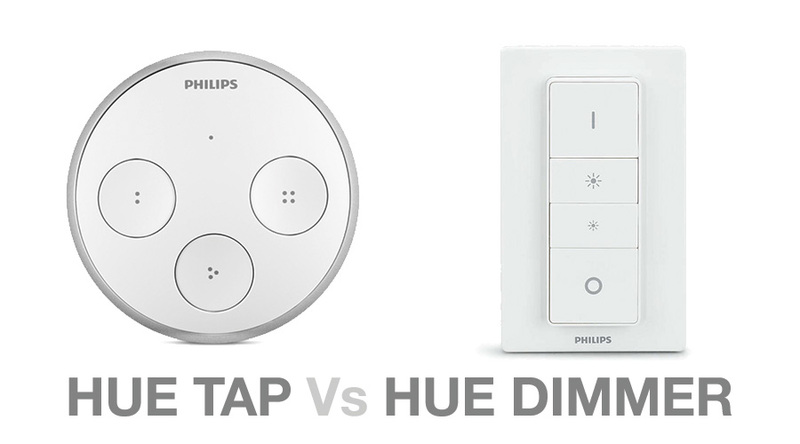 Home » Ideas » Hue Tap Vs Hue Dimmer – Which one to choose? 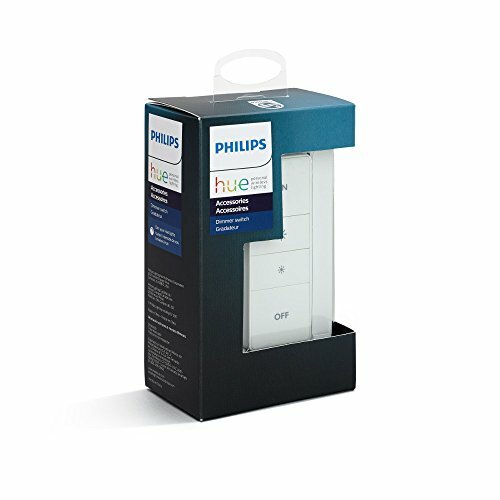 The great thing about the Hue system is that there are a few accessories you van buy that give you a physical switch for the system meaning there is no need to always rely on your phone and also better way for guests to turn lights on and off. Philips have two switches on the market, the Hue tap and the Hue dimmer, both are slightly different in their own ways, but if you are looking to buy one and not sure which, then this guide should help. We have broken the comparison down into different sections, while their function is slightly different, there are also other things that make them different that are good and not so good. For both of them setting up is the same, out of the box you can pair them with your bridge using the Philips Hue app. It is quick and easy and the same process for both. In this case there is no winner as they are both a breeze to get going. A section for power you may think is not needed or important, however there is a difference between the two. The dimmer switch uses a thin coin battery which comes supplied, whereas the tap uses kinetic energy gained through button clicks on the unit itself. So there are no batteries. This may sound like a good thing, however the downsides are it can be a little less responsive than the battery powered dimmer, and you also do need to press the button. The dimmer is easy to use and with a click there is little delay before the lights change, with the tap it is certainly more of a push that a tap to get the lights to change. With that although the kinetic energy function works and sounds good, I prefer the battery powered dimmer. Both are stylish looking devices, the dimmer comes with a wall mount which is around the same size as your traditional light switch, the dimmer buttons are on a remote device that can be removed from the wall mount and used just like TV remote. When not in use you can place back in the wall mount where it is held by magnets. On the dimmer are 4 buttons, from top to bottom you have the on switch, then a brighter button, dimmer button and then the off button. All are press buttons and feel sturdy and robust. The on button can be press multiple times to cycle through up to 5 scenes giving it more flexibility and use. The tap is a circular designed device that has the style of a Nest device which you may already have, again this can be wall mounted or used as a standalone device. On it are 4 buttons, the buttons are marked by small dots, 1 dot on button one, 2 on two, 3 on three… you get the idea. Although stylish the dots are not as clear, and with the device being round it means that when it comes to pressing the correct button it does take a little more effort to make sure you are pressing the correct one. This may sound silly but for ease of use the dimmer is slightly better. The 4 buttons on the tap can be set to different scenes, allowing you to easily have a button for a different scene, ideal for living rooms, bright light, movie night, reading and party. There isn’t any dimmer functionality on this device where as the dimmer is specifically designed for this. For me the winner for design and ease of use is the dimmer, it is easy to use, responsive and well laid out. For me there is only one winner here and that is the dimmer, the tap is nearly double the price and although has its uses, the cost difference for anyone that wants a physical switch in their home for their hue system makes the dimmer the easy winner here. Both are slightly different and it depends on what function you need, however both can be taken further by the use of third party apps where you can change the buttons on both a bit more and also add in extra functions by holding the dimmer buttons for example on the dimmer switch. As for which to buy, our choice would be the Hue dimmer, it works well, you can still cycle through scenes as you can on the tap, it is cheaper and I love that you could install it over your existing light switch. I’ve got a tap and don’t like it, it works and does what I want it too, but much prefer the design and feel of the dimmer in my other room. I have a long hallway can the Phillips Hue Dimmer be used as a 3 Light switch? Yes, you can have a whole room controlled by the dimmer, in your case the hallway.